Manila, Philippines – This August, users of Google Maps (http://maps.google.com) will now be able to use the “Get Directions” Button to plan trips using Metro Manila’s four train lines: The LRT1, LRT2, MRT3, and the PNR Commuter Train. 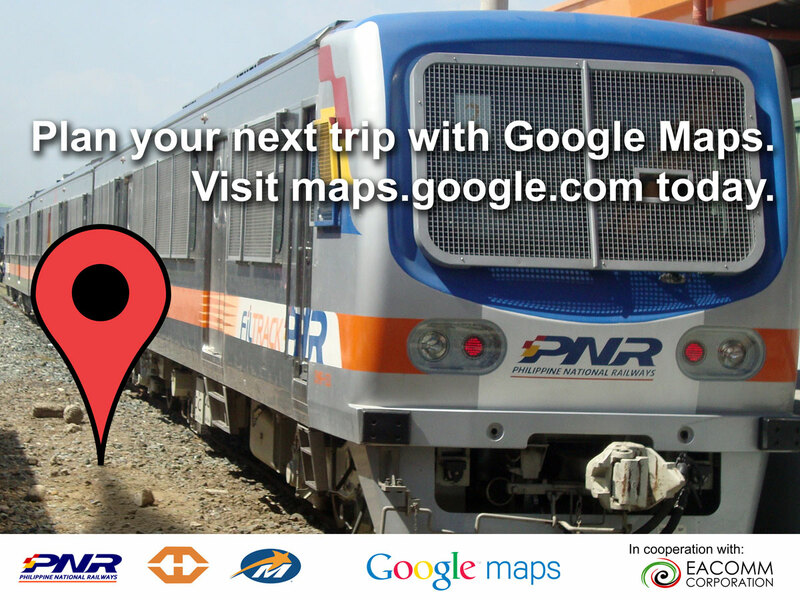 Simply type the origin and destination points in the maps search bar and select the train icon and Google Maps will show you the nearest train station, where to transfer trains, how long the journey will take and how much it will cost you. This new feature of Google Maps is anticipated to increase ridership of public trains by providing more information on alternatives to driving by car or taking the taxi. For example, traveling from Marikina to Alabang at first glance is a long, arduous and expensive journey if you will be commuting. 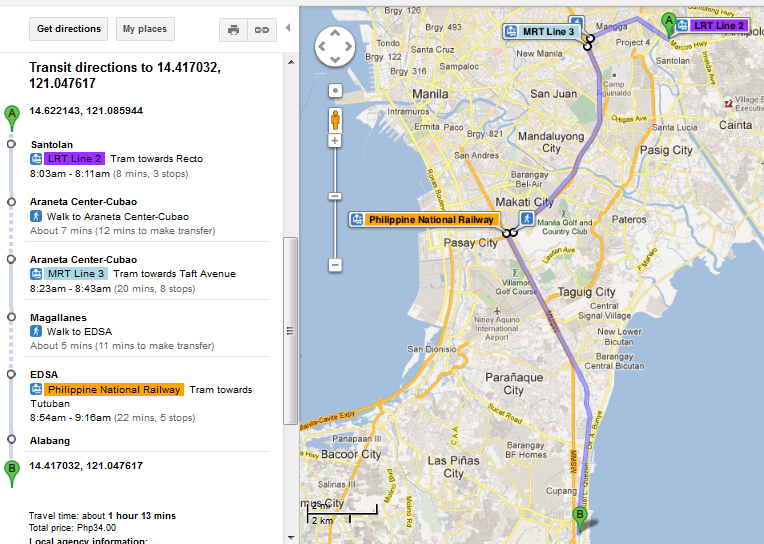 By using Google Maps to plan the trip, it turns out by taking the train (LRT2->MRT3->PNR) it would take just over an hour to make the trip in rush hour traffic for only Php 34.00! 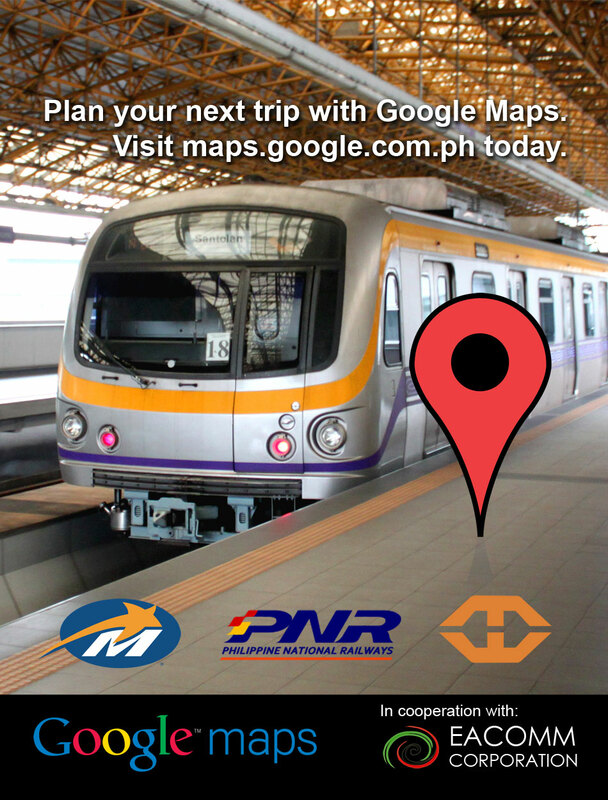 Data collection and formatting services was provided by EACOMM Corporation, a web and software development company based in Quezon City, who are currently working on the next stages of the project which entails the inclusion of bus and ferry schedules to Google Maps. This will create a much more comprehensive coverage of Metro Manila’s public transport system not only within the metropolis but to and from neighbouring cities and towns as well.